What a fabulous episode! The Tinder Box gave some really brilliant and top-notch performances, dynamics, and one-on-one character interactions. Season four is proving out to be quite substantial and thrilling and always bending the rules. Yet, when has The 100 not broken any rules? Alright, I am just going to put the highlights in bullet points, then write a paragraph wrapping up my feelings and reactions about everything. Raven having a hallucinating seizure due to her brain damage. Abby is starting to feel the effects as well when she hallucinates a radiated burned Clarke at the end. Clarke saving Octavia’s life after Ilian carries her back to Arkadia. The Azgeda/Skaikru coflict where Bellamy and Kane were chained prisoners, and everyone was on edge. 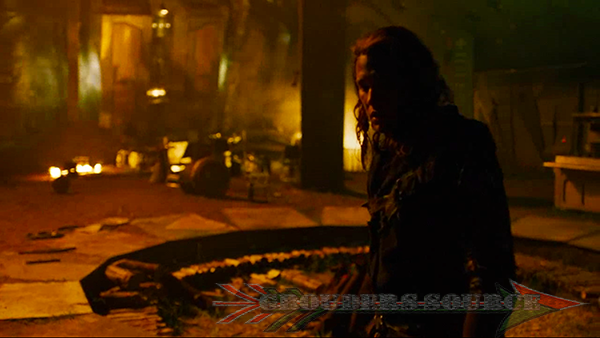 Riley about to snap because he is suffering from PTSD, and is about to shoot King Roan. Clarke and Roan go off together to discuss the usage of Arkadia, and Roan wants half. Bellamy and Echo go off to find Riley. They did, and Bellamy tries to talk him out of killing. Riley listens. Raven finds a 100-year-old shuttle transporter, as a result from her hallucination. As Nightblood cannot be made on the ground due to RNA getting deformed. The Nightblood has to be formulated in space. We learned that the main reason why Ilian brought Octavia home to Arkadia was to survey the tech. Octavia knew this from the get-go, but she was in comatose before she can address it. Monty was a very brave and determined guy in the episode. Bellamy realizing that Octavia’s alive was joyous and he felt complete. Ilian burns Arkadia to the ground from the server room. Niylah and Octavia tried to talk him out of it, but no avail. Arkadia is burning and everyone is in despair. Their home is now gone. Ilian saves both Octavia and Niylah, so I guess that semi-qualifies him as a hero. Octavia looking so frail and tiny in Bellamy’s arms was almost too much. It got me going when Clarke grabbed a hold of Octavia’s hand so that there was some comfort whilst watch the travesty. Raven is using a large percent of her brain, thanks to ALIE’s upgrade. But why hasn’t Abby received the same thing? Bellamy tells Echo that sides do not matter when it comes to the radiation. It will take everyone in its path. In conclusion, The Tinder Box was an emotional episode, and luckily, nobody died. My reactions took a fast roller coaster ride with this, as I am sure it did for everyone. I feel sorry for the majority of the characters as they have to constantly fight, but seem to go a few steps back. There is always that small window of hope, and I believe that is why they’re trying so hard to live. My one thought thought is why did the Guard let Riley come when they knew that he was so unstable? He could have made a mess out of everything. I was semi-happy that Clarke’s radiation was not real, but that had to scare the flying crap out of Abby. Clarke is her pride and joy, so that had to been horrible for her. Also, the expression on everyone’s faces when Arkadia was engulfed in flames, and that Titanic-like score playing was just shattering. I don’t think Ilian will be forgiven for his crime as he placed lots of people in danger. Well, even more danger. Yet, he was also very mentally traumatized as well, and they may have blocked of what he was doing was wrong. I enjoyed everything about The Tinder Box, from plot to parallel to compassion, despair and hope. And, I want more! The 100 We Will Rise will air tomorrow night. Don’t miss it!